One more way to enjoy the great taste of sweet potatoes. 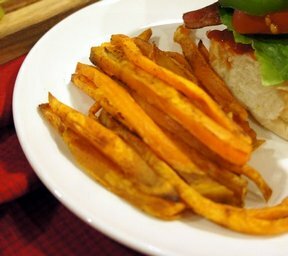 These tasty sweet potato sticks make the perfect side to burgers, steaks, and chops. Wash the sweet potatoes (do not peel) and cut into pieces that are approximately 3 inches long. Slice lengthwise if the piece is fairly thick. Place sweet potato sections into a saucepan and cover with water. Bring to a boil and boil about 10 minutes or just until they begin to soften slightly. Do not cook until tender. Remove from heat and drain water. Allow to cool slightly and then remove the skins. 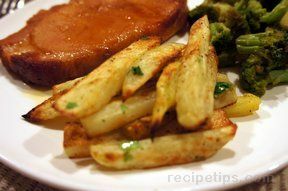 Cut each section into french fry-style sticks. Use a large cookie sheet with sides and coat the bottom with a thick layer of cooking oil. 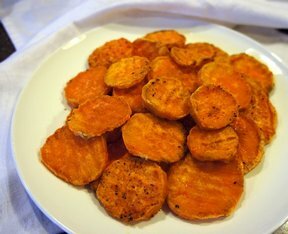 Place the sweet potato sticks on the coated cookie sheet. Mix the cinnamon and sugar; sprinkle evenly over the sweet potatoes. Sprinkle the cinnamon and sugar to your desired taste. You do not have to all of the mixture. Place in the preheated oven and bake for 15 minutes. Remove from the oven and turn the sweet potatoes over. Return to the oven and bake for an additional 15 to 20 minutes or until desired doneness. 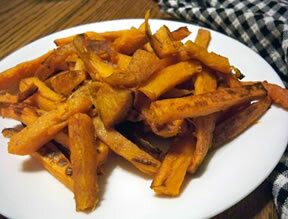 Baking time will depend on how crisp and browned you would like the sweet potato sticks to be. "We love sweet potatoes but I usually just bake them whole. This recipe was a nice change. It was more work but worth the effort. I will make them again sometime."